The Everest patio door combines the solidity of a wood frame with the aesthetics and durability of vinyl. The patio door has an exclusive handle with a double latch. The vertical rails are reinforced. 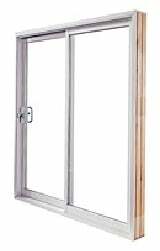 • 5 5/8" or 7 1/4" sturdy wood frame with exterior cladding. • Anodized extruded Aluminum sash and screen rolling tracks. • Galvanized Steel Stiffeners into vertical stile. • Exclusive sash handle with a double latch. • 10 degrees sloped sill. • Double weatherstrip at meeting rail. • A variety of exterior colour choices • Exclusive sash handle with a double latch.